It’s sad to see how little people think through their positions on some issues. Whether it’s gun control (expecting criminals to obey laws), refugee resettlement (knowing we can’t vet the people coming from countries with a strong terrorist presence yet demanding we allow them entrance anyway), or in this case, a historical ethical dilemma, no one seems to consider the issues past the surface level. I don’t often study the morality or sensibleness of history’s decisions. I tend to learn about them objectively and accept that they have already occurred. However, being one of a dwindling number of people that thinks nationalism isn’t sinful and it’s okay to love America, I’ve begun to look more at her history. It’s far from perfect, I admit, with things such as slavery, Native American resettlement, Japanese internment, Jim Crow laws, abortion, and other injustices. But that doesn’t mean that every decision that initially appears questionable was a bad one. Among my considerations is the use of two atomic bombs against Japan at the end (coincidence, I’m sure) of World War II. This particular event has ignited controversy, but I believe it was completely justified. With Victory over Japan Day tomorrow, I thought it fitting to examine the ethical dilemma of deploying atomic weapons to end the war. The use of the atomic bombs has a unique historical context. While in other situations this might not have been necessary, in the case of that particular enemy and that particular war, it was entirely fitting. Most, including myself, would not desire such an outcome, but making a sweeping statement on the immorality of the deployment of atomic weapons while offering no consideration of the specific reality faced in 1945 shows historical ignorance or intellectual dishonesty. There was a rationale behind this decision. Take note that this in no way disrespects the Japan of today and its culture. It is no longer a militaristic empire. This also does not trivialize atomic weapons. They are very serious and any decision to use them needs clear reasoning. While I do not foresee a day when there are no atomic/nuclear weapons, I have no desire to ever see them used again. As the reader will see, the particular use of the atomic bombs on Hiroshima and Nagasaki was, unfortunately, the least deadly scenario. 1. Japan was the aggressor, not America. Does this alone justify using the atomic bombs? No, I don’t think it does. But it is important to bear this in mind. The U.S. avoided World War II for over two years, when much of Europe, North Africa, and East Asia was caught up in it. 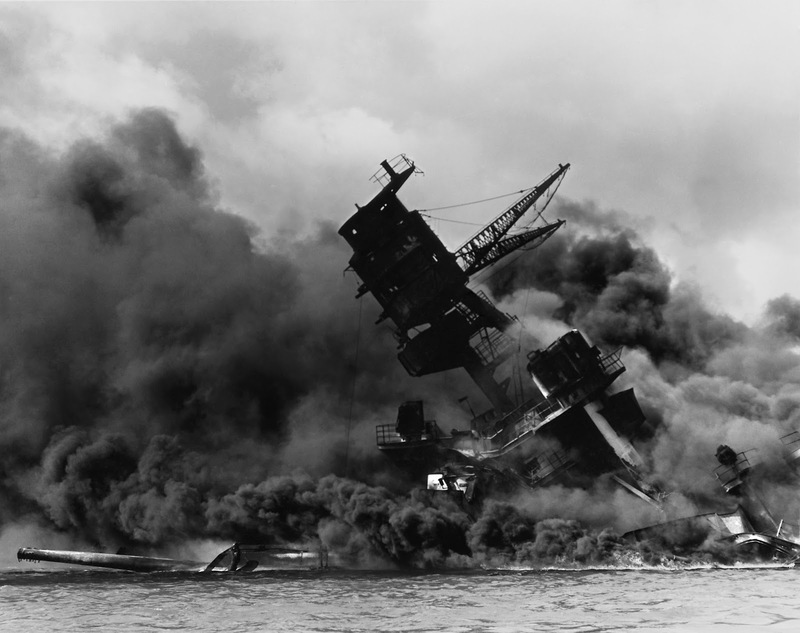 What brought the United States into the war was a massive surprise attack on Pearl Harbor that was planned years in advance. 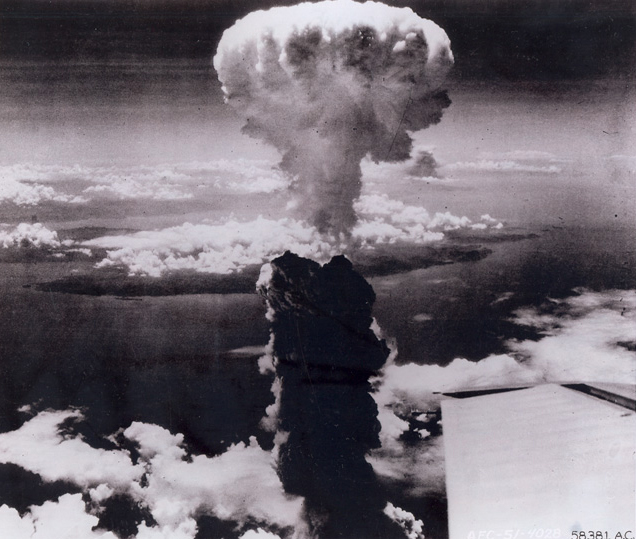 (The U.S. had sold old bomb shells to Japan for scrap metal to be melted down a number of years before the attack. One that was unexploded was found in a sunken battleship. Japan was collecting them to make improvised bombs to drop on ships in the Harbor.) The loss of over 2400 people (including 68 civilians) that day brought America into the war. 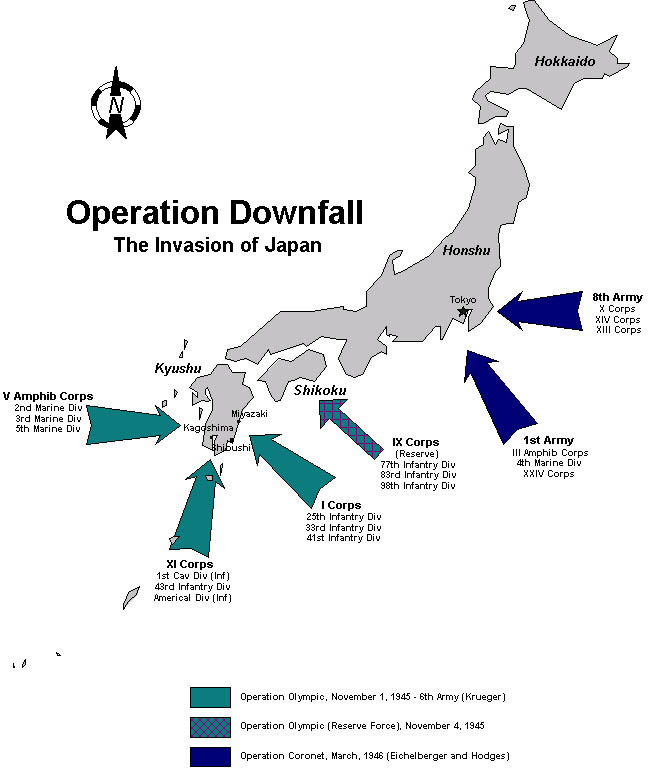 It was Japan’s desire to fight us, not the other way around. We simply finished what they started. 2. 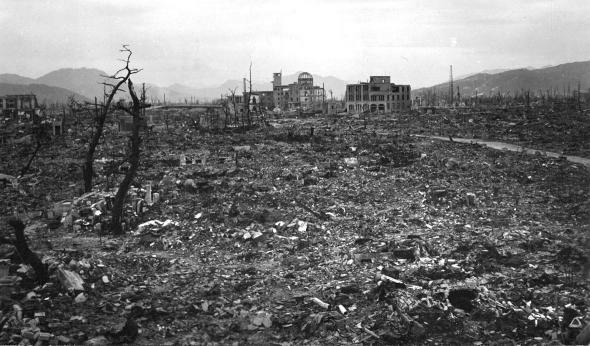 Hiroshima and Nagasaki were military and industrial cities, and the target areas were military and industrial. Hiroshima was the headquarters of a number of military armies and divisions, including the Second General Army that was in control of the defense of southern Japan. Over 40,000 military members were stationed there. 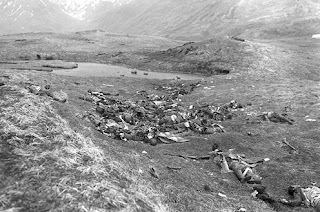 (Half of these were killed by the bomb, further showing that this was not simply aimed at civilians.) Hiroshima also had a large military stockpile. The city was a key shipping port, a communication center, and an assembly area for troops. converted in Nagasaki's Mitsubishi Shipyards. The primary target of these two bombs was not civilians. Their deaths were an effect, not the primary goal. This was not an act of genocide. This was a blow to the industry of the Japanese war machine by crippling seaports, destroying factories, and killing the workers that kept the military going. These cities weren’t chosen based on their populations and the structure of their buildings. They were chosen based on their military value. Most of the people in these cities, especially Nagasaki, were more than simply civilians. They were the people supplying the Japanese empire with munitions and equipment by working in the factories of these industrial cities. To crush the Japanese military, their supply chain had to be cut off, just as it was in so many other cities by conventional bombs. 3. The culture of Japan taught the people to never surrender. The United States wanted the maximum psychological impact possible to break Japan’s will to fight. This was a nearly impossible task. This is the key point to understanding why the atomic bombs were necessary. The Japanese attitude towards surrender explains why Truman decided on such an extreme measure. Up until the August 1945 surrender, only one Japanese military unit had surrendered (a starving battalion in New Guinea). Soldiers were taught a perverted form of the Samurai Bushido Code that believed it was a disgrace to surrender. Reports from Iwo Jima, as stated in Flags of our Fathers, stated there were mass suicides in the tunnels of the island. If the Japanese did not win, they would die trying. This is true of the reports of other battles. The Japanese soldiers would continue to fight regardless of the odds until they were all gone. It’s why – out of 22,000 Japanese on Iwo Jima – all but 216 died. This was also engrained in the civilians of Japan. As the U.S. closed in on Saipan, Emperor Hirohito himself decreed that citizens should commit suicide rather than fall into the hands of the American army. He feared that if the Japanese people saw the generous treatment by the Americans, they would defect. They were promised a privileged place in the afterlife in return for their deaths. 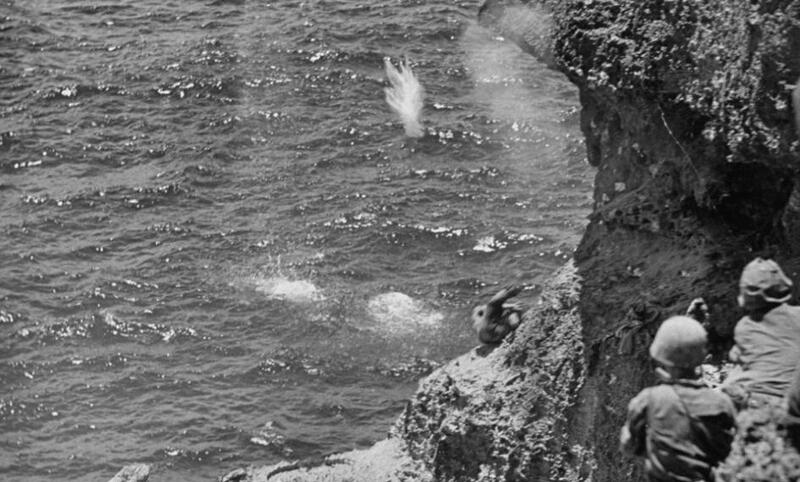 One thousand people at Saipan committed suicide, many by jumping off the now infamous “Suicide Cliff”, when they knew the battle was lost. When the Soviets invaded Manchuria, the Japanese army killed its own citizens as it retreated. There truly was a “victory or death” mentality forced not only on the military, but even on innocent civilians. Japan’s citizens would have been much better off in the care of the Allies rather than be pawns in the twisted mania known as the Japanese “fighting spirit”. Japanese Prime Minister Kantarō Suzuki had a military-dominated cabinet, and all but one favored continuing the war in 1945. 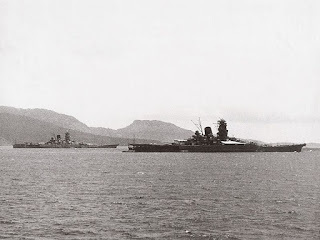 Mind you, this is after a prediction that Japan’s back would be broken by American air and sea superiority. 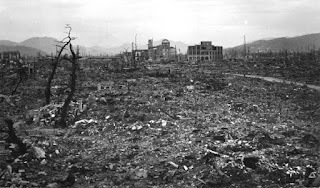 This was after over 60 square miles of Tokyo were destroyed by bombs and incendiary bombs, and a number of other military targets had been hit as well, killing hundreds of thousands. The incendiary bombing of Tokyo killed more than both atomic bombs combined. Even with this grim outlook, the Supreme Council for the Direction of the War publicly held to that they would continue. Japan had never surrendered or lost a war. 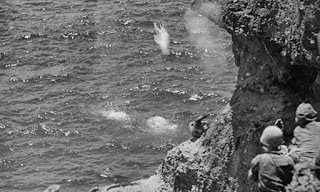 Japanese civilians jump to their deaths in Saipan. Privately, the Supreme Council sought a conditional surrender that would allow their emperor to stay on the throne and the empire to keep some of its territories it had acquired in brutal fashion, among other things. Rightly so, the Allies were not about to meet these demands. With such obstinate military leaders, the situation was not like that of Europe’s. Italy and Germany surrendered when they knew they were defeated and didn’t allow any more military or civilians to be killed after they reached these conclusions. Japan, though, knew it was hopeless but fought anyway. Atomic bombs allowed a powerful weapon to wage psychological warfare through the terror it unleashed. Only drastic measures could provoke Japan into surrendering rather than annihilating itself. If there is any further doubt as to the morality of this action, the final reason should be of benefit. 4. An invasion of Japan would have had many times more casualties than what the atomic bombs caused. Remember when I mentioned the obstinacy of the Japanese? The empire had recruited 28 million citizens – every man between 12 and 65 and every woman between 12 and 45 – to defend the homeland in case of invasion. These citizens were to be used as a “second defense line” to wage a war of attrition against Allied invaders. This militia would carry on the fight and finally resort to guerilla warfare. In the few places the “Volunteer Fighting Corp” was used in battle, such as the Soviet invasion of Manchuria, they were slaughtered. Weapons were scarce, so the Japanese civilians were taught to fight with whatever they could get. Molotov cocktails, swords, knives, pole weapons, antique firearms, clubs, truncheons, even sharpened bamboo sticks. Primitive weapons of fighting amateurs would hardly have matched the trained military power of the Allied forces. Millions of Japanese would have been killed had there been an invasion. If it were up to the military leaders, the Allies would have to kill all 28 million to secure victory. 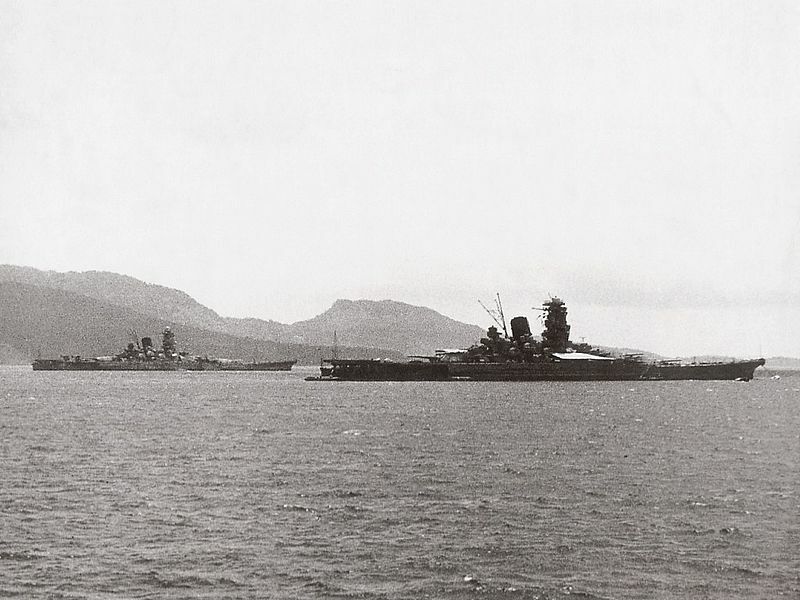 Even with the firepower advantage, the Allies still would have faced the remaining strength of the Japanese forces. What was left of their navy, air corps, and army would have met America and co. on Japanese home turf. It was expected that the Allies would suffer a million casualties. Hmm. Two hundred thousand people of the enemy, or a million of our own people. Tough choice. Add to it the fact that thousands of American prisoners of war would have been executed had the Allies invaded the Japanese mainland. The price to pay was far too high for the U.S., so another option was explored. This was war, and in war nations take care of their own people before they take care of their enemy. In our culture that demands the Western world take in thousands of refugees with unknown backgrounds, clearly many don’t understand the protective role of the federal government for its own citizens. 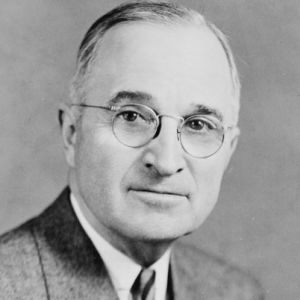 But in 1945, Harry Truman was very conscious of it. The United States and the other Allied nations wanted to avoid an invasion because they knew, with the “never surrender” attitude of the Japanese empire’s culture, that it would be a bloodbath. They didn’t want to sacrifice more men than was necessary. The atomic bombs provided a means to avoid that conflict. And, whether they intended to or not, they saved millions of Japanese lives in the process. Only when the emperor was dangled over the precipice of oblivion did he decide that they must “endure the unendurable” and surrender. This was not a light decision, keeping in mind all that he had allowed Japan to go through. Incendiary bombs didn’t work. Plans for a massive invasion didn’t work. The crushing of his powerful navy didn’t work. 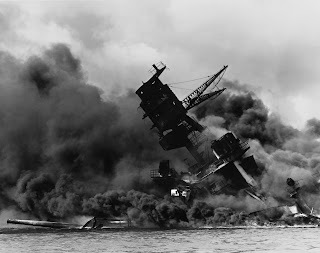 There very well might have been nothing else that could have broken the backs of the maniacal Japanese “fighting spirit” other than the mysterious new bombs that could do damage like no other, and the threat of more falling on Japan’s cities. Perhaps in most other situations this would have been needless. But with the understanding of Japan’s position and the mounting costs to Allied and Axis powers alike, the use of atomic bombs was not only justified – it was the most ethical course of action. "So God turned the captivity of Job..."
That really struck me. The final thing that turned Job’s life back from its terrible depths was the prayer offered for his friends. 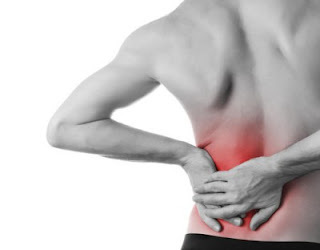 A couple weeks ago, I started feeling a lot of pain in my lower left back. At first I thought I might’ve pulled a muscle, but the pain soon became familiar. Even my parents picked up on it. I had my first kidney stone during my last semester of high school. It came on one night and we weren’t totally sure what it was. So I went to the ER at Sycamore Hospital. I passed it that night and went to school the next day. The residual pain was amplified by the fact that several friends enjoyed giving kidney shots and perpetually forgot about my misfortune. The second time it happened was my first semester of college. I woke up one morning feeling ill but tried to fight it. I went down to the dining hall and filled a plate, but couldn’t eat. I threw the food away as I quickly realized that it was another kidney stone. I walked to our health clinic, but it wasn’t open that early. So I went to the bathroom and stayed there for a good while until I passed the stone. I then made the mistake of going to the health clinic anyway just to check in with them, and was made to go back to see a nurse. They pressured me to go to the ER, but I refused, though they did end up making me miss half of my first class. The third time was on winter break during my first year of college. The pain came on at night, and for a while I fought it, thinking I could get by without going to the ER again. After vomiting, which I rarely do, and continuing to be sick, we decided to go. It turned out that time I had two stones, both of which I passed at the hospital. I promise this has a purpose. We determined after that that one of my medications for headaches, Topomax, was causing the kidney stones. I weaned off it and replaced it with something else. It seemed things were solved. Fast forward two-and-a-half years later, and it’s happening again. I held out for a little while, but we eventually opted to go to the ER. Unlike two years ago, there is now a stand-alone emergency hospital in my hometown, so it was a quick drive. They confirmed it was a kidney stone, gave me a drug for pain, prescribed a couple medications, and sent me on my way in 90 minutes. I hadn’t passed it there. It seemed odd to me that I had left without seeing it through, but I figured with the medicine and lots of fluids, it wouldn’t be too long before I did. I initially didn’t have a strainer to catch it, so I wasn’t certain if I’d passed it and was feeling a lot of residual pain, or if it was still there. My mom polled a couple nurses we know, who seemed to think with as much pain as I was still in, I hadn’t. I agreed, as I still felt the same pain in my kidney. The medications were causing some pretty bad side effects, so it was hard to bounce between kidney pain and side effects. I knew something was odd, because it had never taken more than about six or seven hours to pass a stone. But days were going by. By the time Thursday rolled around, I had to make the decision to forgo my trip to Philadelphia for pro-life evangelism I’d been planning. That night marked three full days without relief. Still I had unrelenting pain. My parents and sister left for a retreat the next day, which I also could not attend. A fourth day went by, and still the stone had not moved. I was alone for much of Saturday while my brother was at work. I had been continually thinking about what I had done to warrant this pain. I reminded myself that it was not always sin that left God’s people in such situations. Sometimes it was merely things that happen in a fallen world, or something to build faith in God. I recalled Job, who had some of the worst problems of anyone in the Bible, and had done nothing wrong. 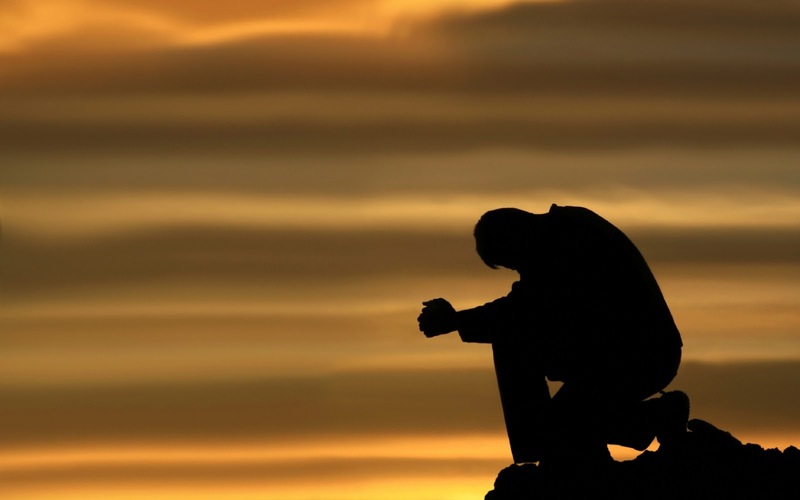 I like to ask friends of mine on occasion if there is anything for which they need prayer, just to check up on them and see what their needs are. I especially do it for friends at college while we are on break. For some reason, though, I hadn’t done it this summer. And pretty much the whole week, I’d hardly prayed at all because I found it hard to concentrate. 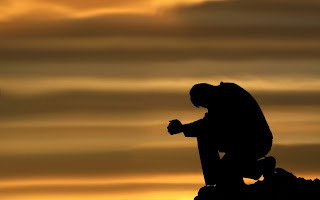 When I did, it was in a moment of great pain, asking God to relieve it and rid the stone from my body. I hadn’t really thought to pray for anyone else. So I decided to do as Job did. I texted dozens of friends from school and asked them if they needed prayer. Don’t think this as overly spiritual; I had nothing much else I could be doing anyway. I merely took encouragement from how God commanded Job. Throughout the day, texts came in to me about all sorts of things. Personal struggles. Upcoming decisions. Health problems. Some even asked in return if I needed prayer. So all through the day, I was stopping and praying for friends. And early Sunday morning, the kidney stone passed. I had begun to think some more drastic measure would be needed. For five days I took medicine and drank copious amounts of fluid. It didn’t seem to work. The stone was lodged in my kidney. But God solved the problem when I prayed for my friends. So when you’re in a difficult circumstance, look up. But don’t just think of yourself.